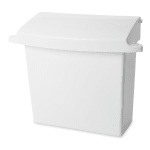 Measuring 10.75 inches long by 5.25 inches wide by 12.5 inches tall, the Rubbermaid FG614000WHT sanitary napkin receptacle fits in most restroom stalls. Its rigid liner is removable and can be cleaned quickly. The lid fits tightly onto containers to contain odors. In our bathroom basics guide, we cover some of the most essential accessories needed in commercial restrooms.